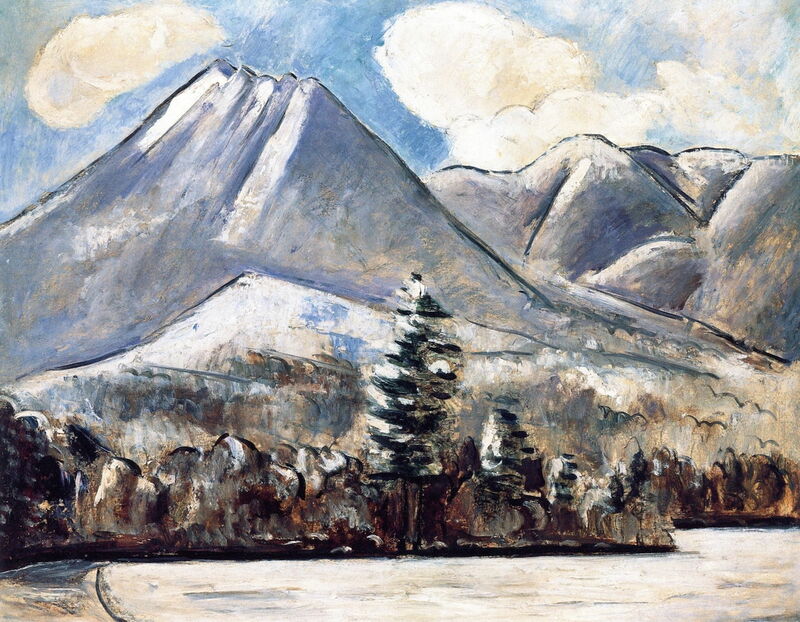 In the first article, I traced the career and paintings of Marsden Hartley (1877–1943), until he returned to Europe in 1921. He then travelled quite widely, although based in Aix-en-Provence between about 1925-28. 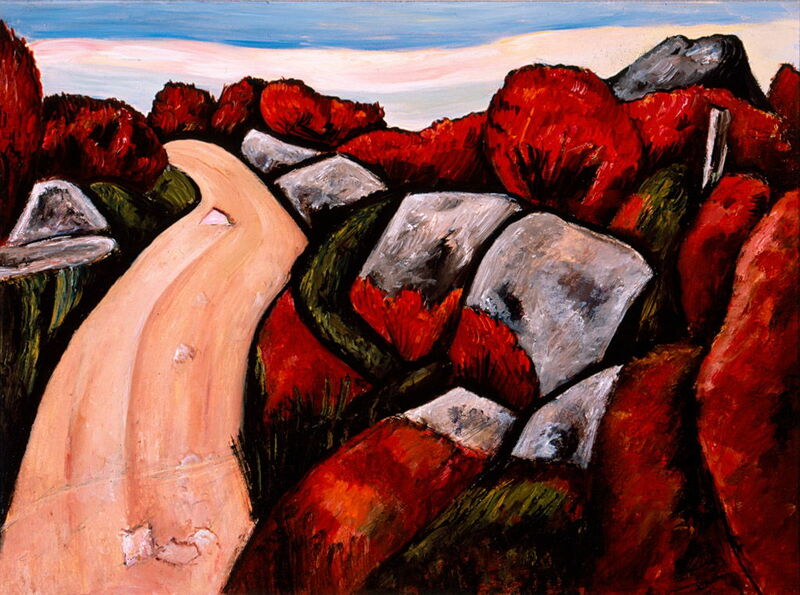 Marsden Hartley (1877–1943), Landscape (1925), oil on panel, 36.8 x 46.4 cm, Herbert F. Johnson Museum of Art, Ithaca, NY. Wikimedia Commons. 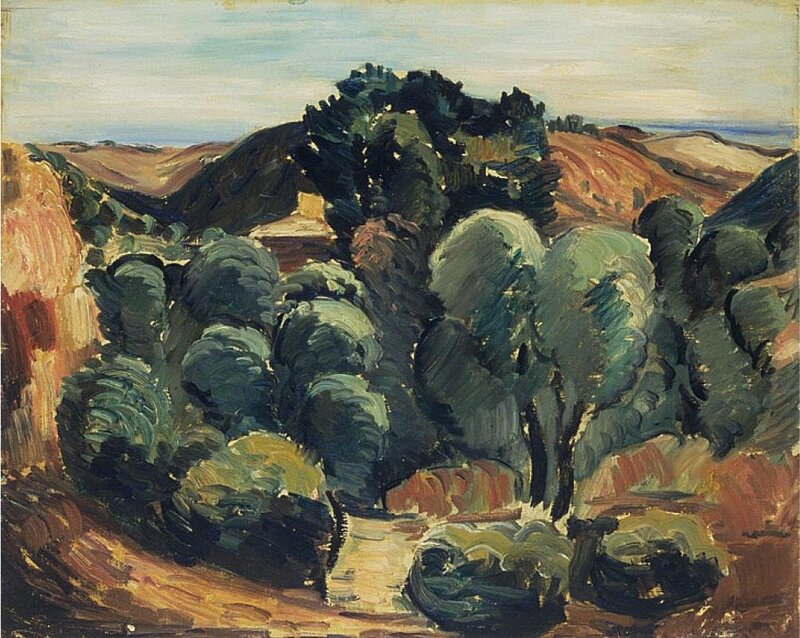 Many of his landscapes from those years were strongly influenced by Cézanne’s later paintings, such as his Landscape (1925). This shows extensive use of Cézanne’s constructive stroke, patches of parallel brushstrokes which are relatively independent of an object’s form. Marsden Hartley (1877–1943), Landscape, Vence (1925-6), oil on canvas, 65.1 x 81 cm, Frederick R. Weisman Art Museum, Minneapolis, MN. The Athenaeum. 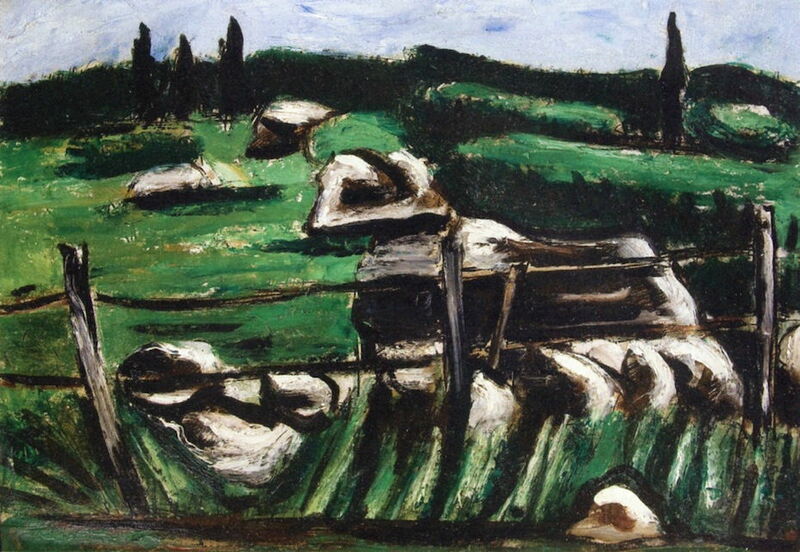 In paintings such as his Landscape, Vence (1925-6), he used patches of brushstrokes to model the form of the land. Vence is a town on the Côte d’Azur, between Nice and Antibes, and I suspect that this view comes from further inland in the Alpes Maritimes, some distance from Vence itself. 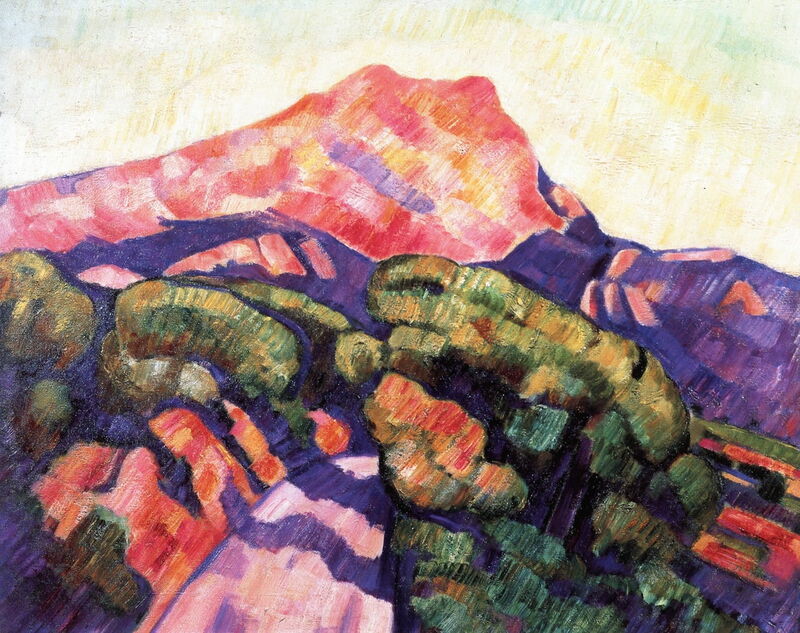 Marsden Hartley (1877–1943), Mont Sainte-Victoire, Aix-en-Provence (1927), oil on canvas, 64.8 x 81 cm, Private collection. The Athenaeum. His homage to Cézanne took him to paint some of the master’s best-known motifs, including Mont Sainte-Victoire, Aix-en-Provence (1927), which became an obsessional view in Cézanne’s later years. Hartley dutifully used constructive strokes, and even more vibrant colours than Cézanne. In 1930, Hartley returned to the USA, and visited some of the classic locations in Massachusetts, including Dogtown, the abandoned settlement between Gloucester and Rockport. On an early visit there in 1931, he painted his Blueberry Highway, Dogtown, an unusual take on this desolate wooded and rocky area, which must have been in the fall/autumn. Hartley wrote that Dogtown was a cross between Easter Island and Stonehenge. He was awarded a Guggenheim travel grant in 1931, which took him to Mexico for a year, where he indulged in his fascination for pre-Columbian culture. Marsden Hartley (1877–1943), Gloucester Fantasy (c 1934-36), oil and pencil on board, 59.7 x 44.5 cm, Private collection. The Athenaeum. Gloucester Fantasy (c 1934-36) shows the seaport of Gloucester Harbour, which much earlier had been the busiest in the US. Hartley made graffiti in the oil paint using a pencil. Marsden Hartley (1877–1943), Dogtown Common (1936), oil on academy board, 23.2 x 33 cm, Frederick R. Weisman Art Museum, Minneapolis, MN. The Athenaeum. Dogtown Common (1936) is a more conventional depiction of the abandoned settlement. 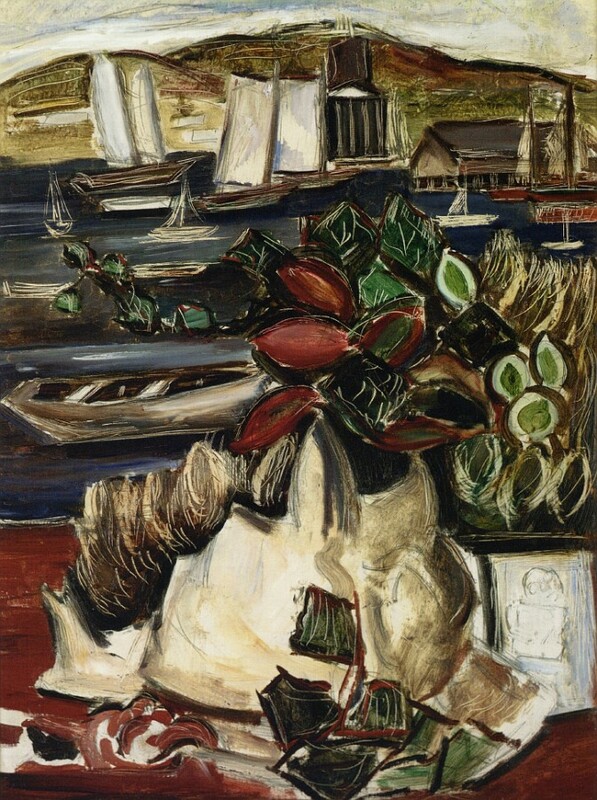 Hartley moved back to his native Maine in 1937, aiming to show life there as “the painter of Maine”. 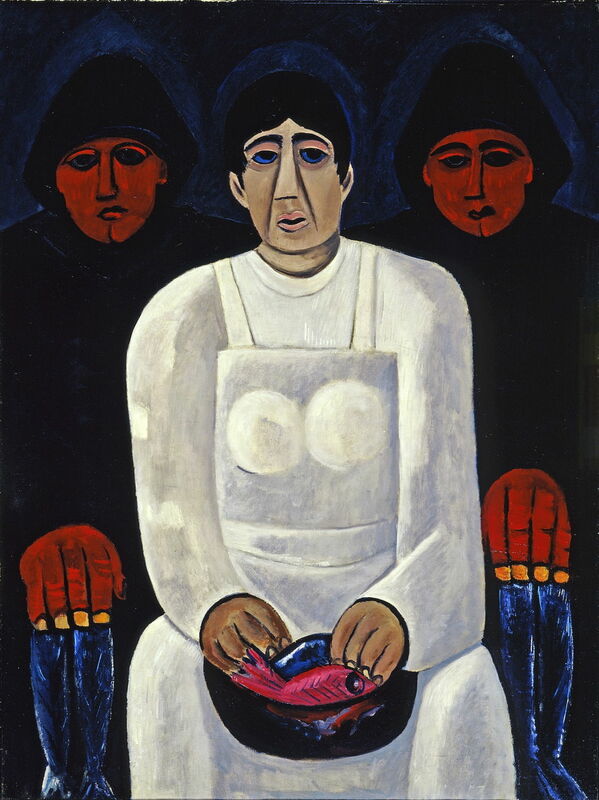 Marsden Hartley (1877–1943), The Lost Felice (c 1939), oil on canvas, 101.9 x 76.7 cm, Los Angeles County Museum of Art, Los Angeles, CA. Courtesy of Los Angeles County Museum of Art. Wikimedia Commons. His portraits and figurative paintings, such as The Lost Felice (c 1939), have a primitive simplicity which distances them from his more than thirty years of experimentation and experience. In September 1935, Hartley travelled to southern Nova Scotia, where he made friends with a fishing family who lived on a rugged island there. He became emotionally attached to the two brothers, Alty and Donny, and thought that he had at last found true happiness with them. In September of the following year, though, both brothers and their cousin were drowned at sea. This painting shows Alty and Donny, sat either side of their sister. This is taken as a modification of the Man of Sorrows image of Christ, in which Alice, the sister, replaces the figure of Christ, and her two brothers act as angels. The fish which Alice holds are symbols of the sea, as the instrument of the brothers’ death, and of Christ. Hartley referred to Alice as Marguerite Felice in an essay that he wrote about the tragedy. 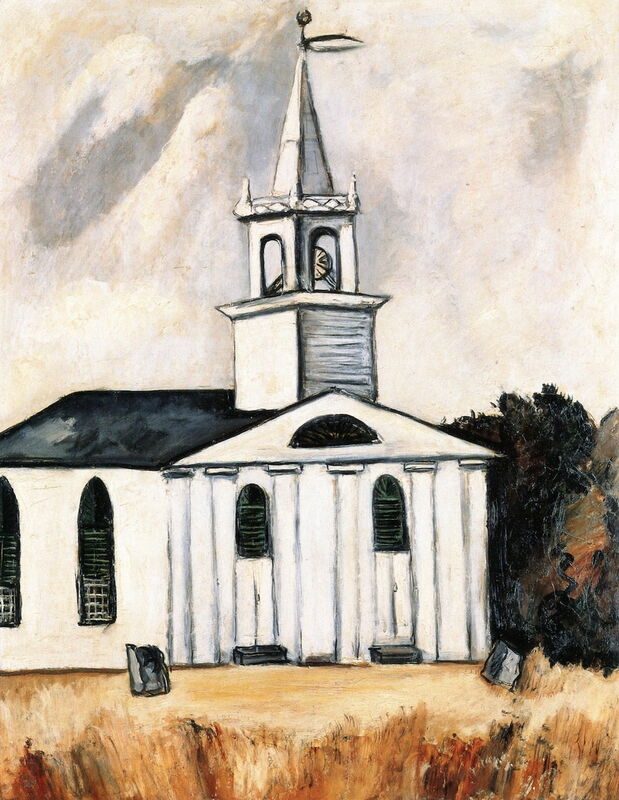 Marsden Hartley (1877–1943), Church at Head Tide (1938-1940), oil on canvas, 71.1 x 57.2 cm, Minneapolis Institute of Arts, Minneapolis, MN. The Athenaeum. Church at Head Tide (1938-40) shows the historic church of Head Tide, a village in Maine, famous as the birthplace of Edwin Arlington Robinson (1869-1935), an American poet who won three Pulitzer Prizes. Some of his landscapes from his later years in Maine show sophisticated development from the post-Impressionism of Cézanne. Mount Katahdin, Maine, First Snow, No. 1 (1939-40) shows the highest mountain in Maine, 1605 metres in height, a rugged peak which is the northern terminus of the Appalachian Trail. 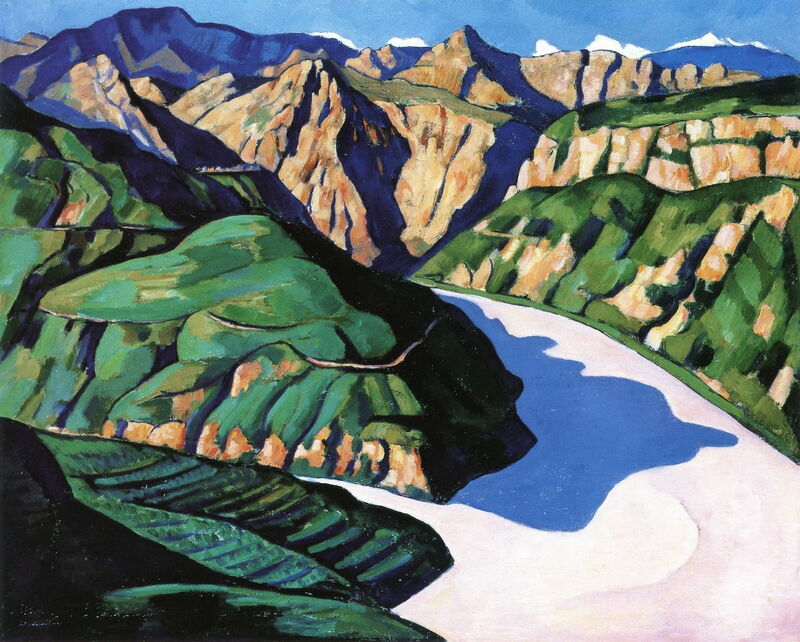 Hartley continued to paint the country around Lovell, and on the Corea coast, until he died in 1943. Over his career he had painted in the styles of Chase’s Impressionism, Segantini’s Divisionism, Cézanne’s Post-Impressionism, pure abstracts (with a touch of Cubism), Fauvist colours, and Primitivism, and perhaps another couple of -isms which I have omitted. Posted in General, Painting and tagged Cézanne, Chase, Hartley, Post-impressionism. Bookmark the permalink. Has El Capitan changed kernel panics?